The Old Iron King was born a lord. He may have been a lord in the land of Alken, a land known to have a strong rivalry with Venn. At some point this lowly lord with limited resources decided to wage war against the Kingdom of Venn. From the far-east came Sir Alonne, an unusual knight who decided to serve this little known and unestablished lord. Sir Alonne quickly became the lord’s most trusted knight. In obeisance to his lord’s request, Sir Alonne trained the lord’s soldiers in the martial techniques of his land and these warriors became the lord’s knights. With the help of Sir Alonne and by utilising every resource he could muster, the lord was able to wrest the now dilapidated land of Venn from its previous occupants and in doing so he crowned himself King. But in the aftermath of the war it was clear that the new King would have difficulty maintaining control of the region. He had spent everything he had in his attempt to gain control of Venn and the land was now wasted. He began entertaining dubious and eccentric guests from faraway lands, many of whom were charlatans, only trying to appeal to the King’s vain nature. Amongst the riff-raff were true masters of their arts, and it may be that this was the point in which the King’s loyal follower, the Magus Eygil became a member of the King’s court. The Old Iron King also kept a display of his vast collection of weapons. These weapons were designed to show off his strength to the world, and to his guests, but emphasized his conceit. He set about establishing his kingdom, using his immeasurable strength. 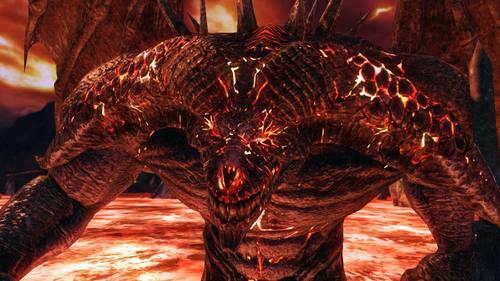 His tower produced for him, endless amounts of iron which he used to create his Iron Soldiers, weapons, armor, an entire keep made of iron, a massive idol in the shape of a bull in honor of Magus Eygil and it is said he even tried to create a dragon out of iron. With the creation of his Iron Keep it is likely the Old Iron King changed his seat of rule from Brume Tower to this new keep, perhaps constructing a new throne for himself. After establishing his kingdom, it is likely the Old Iron King reigned for a long time, but just as every kingdom before him, the curse of the undead began to take a hold of his citizens. By this point, the King had sunken into vulgar hedonism and depravity. Instead of using his great soul to unravel the “greater mysteries” (as in, the reason for the undead curse) the King ordered his lords and soldiers to round up anyone who bore the mark of the undead. The Old Iron King himself led his best men in hunts for the undead, and commanded their capture. They were locked into cages in the Huntman’s Copse or mercilessly and repeatedly killed in the Undead Purgatory by the Executioner’s Chariot. The idea that it was a Purgatory shows how little the Old Iron King knew, in his belief that by killing the undead until they hollowed, he was restoring them. The Executioner’s Chariot that controls the Undead Purgatory was created by the Old Iron King himself, a man whose power allowed him to mold iron freely, as if he held sway over the forces of life and creation. The Chariot the Old Iron King created was only to torment the Undead, and it took the form of a horrendous mad steed, a window into the soul of its master. The Old Iron King did not seek to find a cure for the Undead curse, he had no pity on those who suffered, he instead chose to endlessly torture them. It may have been at this point that Sir Alonne left the King. It is said that Sir Alonne deserted his liege after bearing witness to his descent into depravity, and that at the very peak of his sire’s rule Sir Alonne set out again in search of lands yet unknown. What could be the very peak of his sire’s rule but the point in which the Old Iron King believes he has defeated the Undead curse, while also revealing the depravity in which his soul has sunk to? While it was said that Sir Alonne left his king, it is also said that the Old Iron King named his knights “Alonne Knights” in his honor. But why would a king do this when he has been betrayed and abandoned by his most trusted knight? We know the truth. Sir Alonne did not depart the king for another land, he was killed by the Player character, the Chosen Undead. It is likely Sir Alonne was conflicted about his King’s decisions, we see in a room beside Sir Alonne’s boss fight, a simple wooden chair, perhaps that of the lord he had originally aided in overcoming Venn. A reminder of how far the Old Iron King had fallen. Entering the Memory of the Old Iron King, we see that the Old Iron King reflected upon his friend and his friend’s demise. It was a memory that endured beyond his lifetime, perhaps a sign that the Old Iron King still cared deeply for him. Following Sir Alonne’s death the Old Iron King renamed his knights in Alonne’s honor. The curse still raged across his land, and his most trusted knight had been callously murdered at the hands of an unknown assailant. Turning to his most loyal follower Eygil, the Old Iron King began to push the boundaries of what he had previously achieved. In the past the Old Iron King had been able to create his Ironclad Soldiers; minions granted life by an enchantment of souls. He had gone a little further in creating a chariot and enchanting it with perhaps a fragment of his soul, such that it had taken the form of a mad steed and now he wanted to create golems with a will of their own, he wanted to grant fire a will of its own. If he was able to do this, he would be creating soldiers that did not need his commands, that could rival the strength of Sir Alonne and that would be perfect displays of his immeasurable power (and therefore his immeasurable conceit). So together with Eygil, the Old Iron King constructed a new golem that resembled a minotaur in honor of Eygil and his idol. Within its core he infused a soul, with a will of its own. 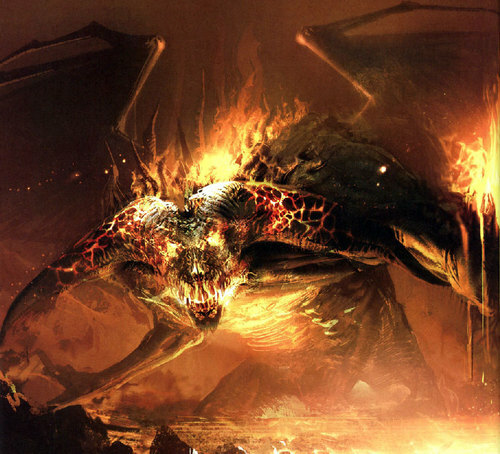 The earth spouted fire and the beast arose from these flames. The Old Iron King did not realise what would happen if a being like this was created, that it would be a demon, and if it had a will of its own, it could choose to turn upon its master. The demon incinerated the King in one swing. The Old Iron King as he had been, was no more. This living fire that Eygil had created began to breed. The fire charred the king’s flesh and possessed his soul. Fire spouted from the earth and the King’s body became a vessel that bred ichorous earth, the blood of the earth (i.e. lava). This lava rose up and consumed the King’s Iron Keep. The Alonne Knights and the King’s subjects, powerful as they were, could do nothing against the rising flames and the Keep was consumed. Because of the king’s conceit the Kingdom was destroyed. The King’s body sunk far below the earth and met the one whose name must never be repeated, the one whose name is ineffable (meaning "not to be uttered"). 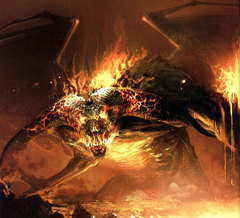 It seems this ancient soul took hold of the King’s and together they formed a demonic-like being that resided within the lava, awaiting any who would approach the altar (as it is called, likely in reference to Eygil's Altar, an unused bonfire name that is most probably the primal bonfire in the Iron Keep) deep within the Iron Keep. After the Old Iron King sunk into the lava, scores of men were dispatched to the land to tap the replete stores of iron, but it was already too late. A child of Dark had taken up residence within Brume Tower and the men soon lost their nerve when faced with Nadalia. So Brume Tower was left much alone. The iron of the castle itself was stripped by opportunistic passers-by, people like Magerold of Lanafir. So ended the reign of the Old Iron King.